Take maida (all purpose flour) in a bowl, preferably a ceramic bowl. Add gramflour to it and mix well. To this, add yogurt and some water. Mix thoroughly and make sure that there are no lumps formed. see to it that the consistency is like a ribbon (when the mixture is dropped from a height, it should fall like a ribbon). Add a pinch of baking soda to this mixture and mix well. 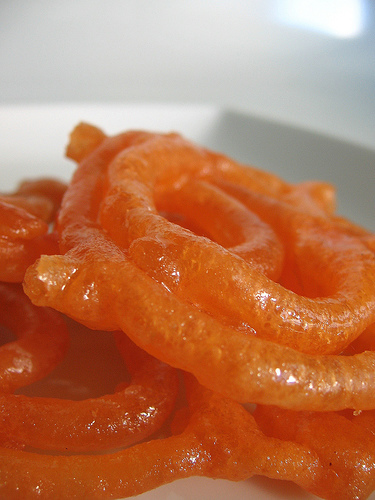 Pour the batter into a jalebi bottle (available in the market), or a ketchup bottle or even an icing bag. Just make sure that the hole/nozzle is not too big. Next, prepare the sugar syrup by dissolving it in water and heating this mixture until it obtains the string consistency that is, when you place a drop of this sugar syrup between your fingers and stretch them apart, the syrup will look like a string between your fingers.Once the consistency is almost reached, add saffron and cardamom powder and give it a quick stir.Now, heat oil on a low-medium flame in a deep-frying pan.Next, pour the batter by squeezing the bottle/icing bag into the pan in a concentric circular motion to obtain a coil shape.Deep fry the jalebis until they turn golden and crisp. Do not over fry or leave it until they are brown. 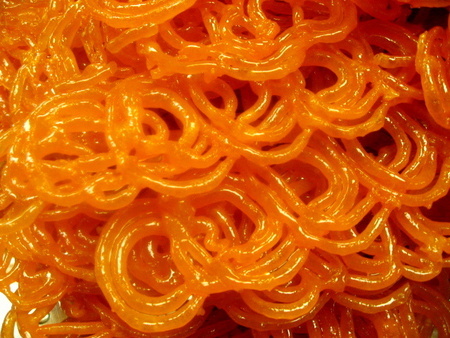 Remove the jalebis and drain them on a tissue paper to remove excess oil.Then, immerse them into sugar syrup for at least 5-6 minutes such that they absorb the syrup well.Jalebis are ready to serve.They taste best when served hot.